Hurricanes are tropical cyclones. 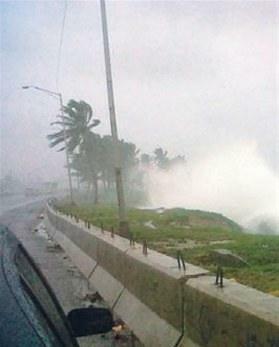 Danger arises through very high wind speeds, waves and heavy rainfalls. In Cuba a common word for a hurricane is 'ciclon'. Season is from May through November. Traditionally, through its well organized system of civil protection Cuba is better prepared for hurricanes then the USA or other countries of the Caribbean. Cuba suffers less loss of human life. Is is not safe from substantial material damages though. Below, you can check the current weather status obtained from the US hurricane center. We are frequently asked: How are we supposed to behave as a tourist when we get	surprised on the island? 2. Follow the orders of the Civil Protection authorities. All our Casas have a solid construction base, none is made of wood. Officially a hurricane starts when wind speed exceeds 118 Km/hour. But even at 50 Km/h persons are advised to seek protection. This would help in all unforseen situations. 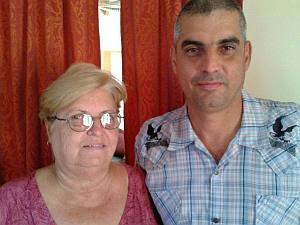 Winnie, our English speaking guide from Varadero would be pleased to show you her native Cuba. Please ask when making the reservation. External data. HolaCuba ™ assumes no liability for the information provided. Buy enough water and basic supplies. Ask where the next Wi-Fi or internet cafe is (although the service might be interrupted). Talk to private drivers no to miss your return flight (buses may not go). If you don't take advantage of our airport pick up service you might be lucky to join some experienced tourists who pool together on the arrivals taxi stand. If you come to Cuba for the first time, please note: bed linen and towels are always included in the private casas. For reservation click on the booking link. HolaCuba ™ is a well known travel portal for Casas Particulares in Cuba serving the tourists from 2001. Mercedes and Frank rent rooms in Varadero from 2011. Frank works in the office and Mercedes stays home and takes care of you, dear Traveler.